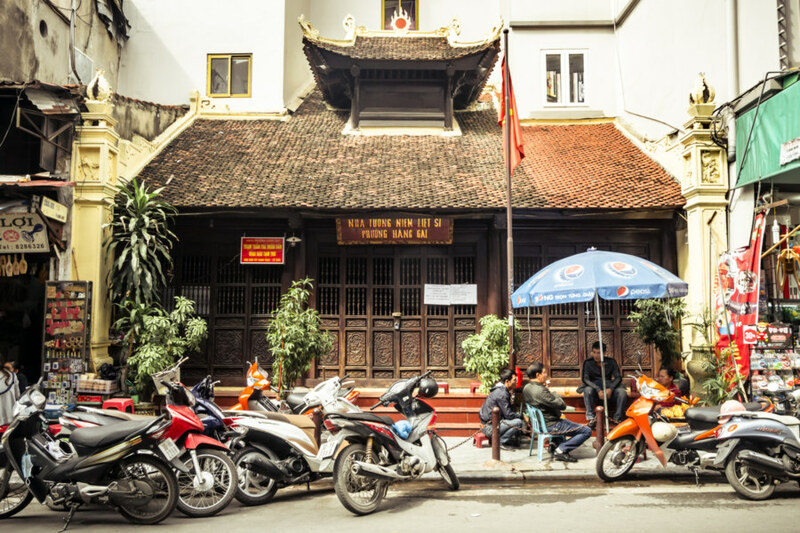 Gathered here are around forty of my better photographs from a five day stay in Hanoi, Vietnam, in November 2016. 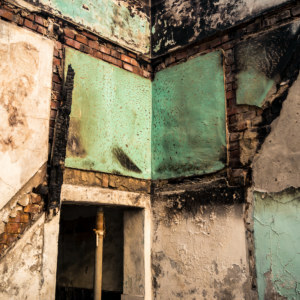 All of these images were captured while idly wandering around the famous Old Quarter and its environs. I was not particularly adventurous on this trip but I still managed to find plenty to feast my eyes upon—and the food and coffee certainly lived up to expectations! 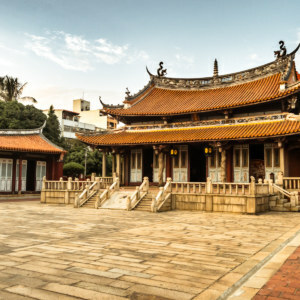 I also found it interesting to apply some of my growing knowledge of East Asian culture gleaned from these years of living in Taiwan. Each photo is annotated with onward links to more information should anything pique your interest. 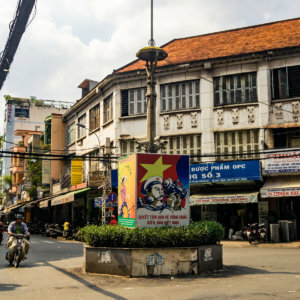 Ba Dinh Square (Quảng Trường Ba Đình), birthplace of modern Vietnam, and the Ho Chi Minh Mausoleum (Lăng Chủ Tịch Hồ Chí Minh). 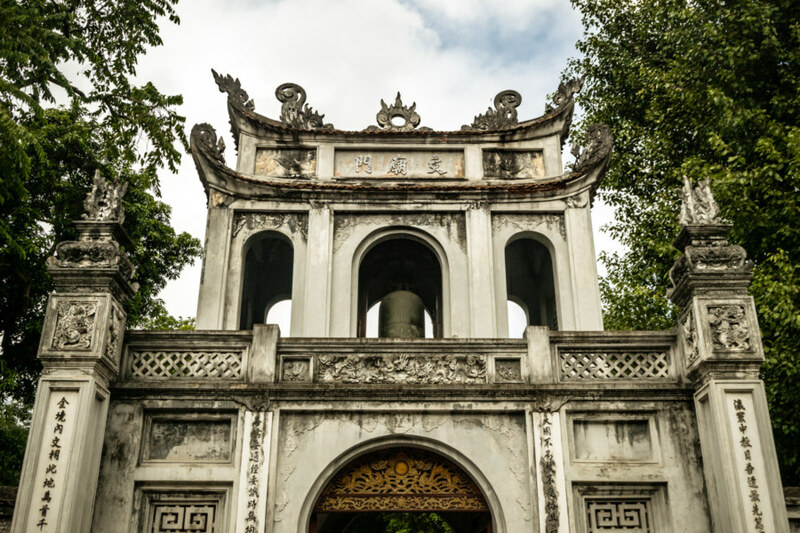 The gateway to Hanoi’s historic Confucius Temple (Văn Miếu 文廟). 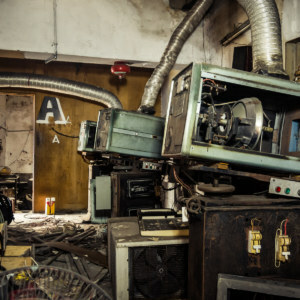 The interior wasn’t nearly as interesting; mostly it felt like a movie set with way too many extras milling around. 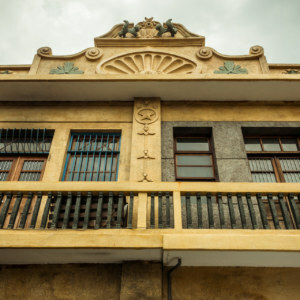 One of the many magnificent shophouses of the Old Quarter. 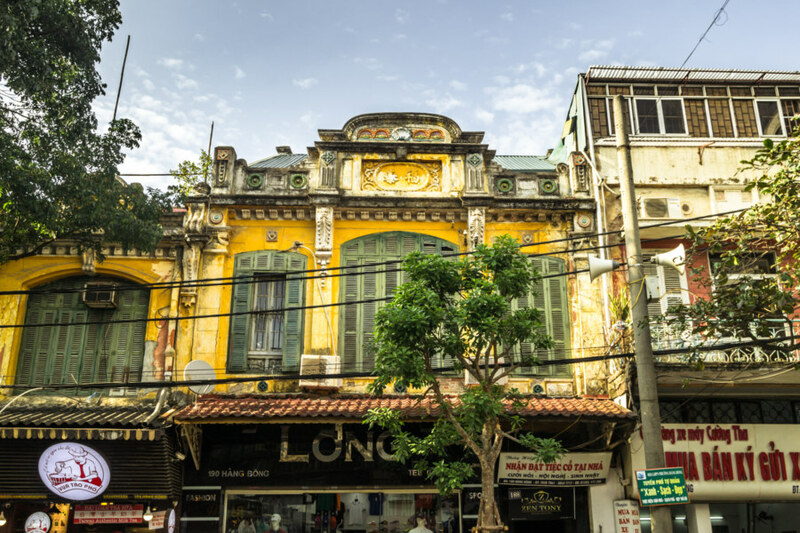 Many of these old buildings adhere to this same burnt yellow and deep green colour scheme. 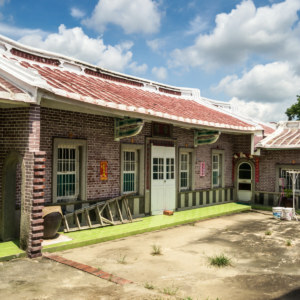 The architectural style is very beautiful and an interesting contrast to the Japanese colonial era shophouses of Taiwan that I am more familiar with. 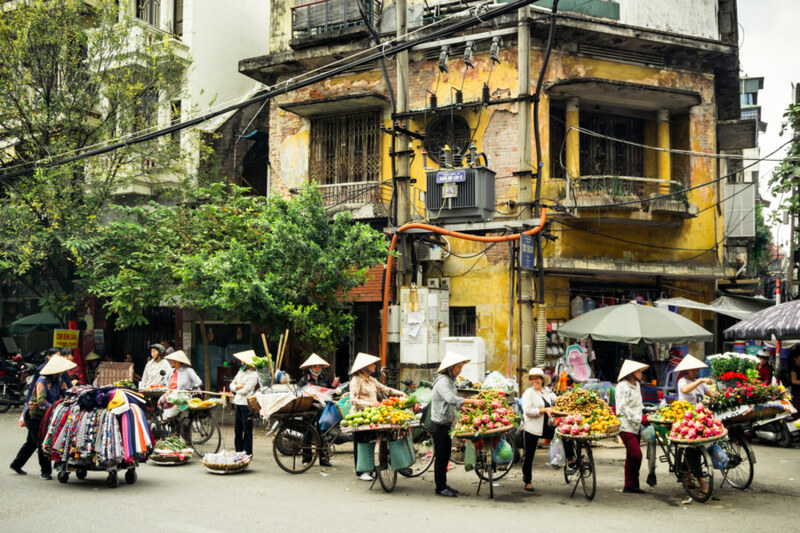 Hanoi street vendors gathering around back of the central train station. 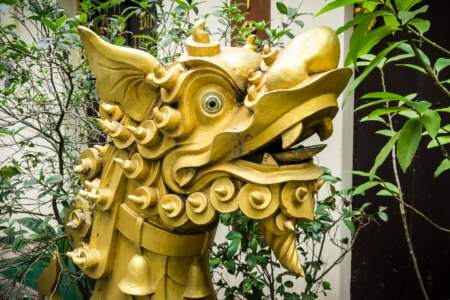 A Vietnamese-style dragon in front of Đình Tân Khai (also known as Đình Thái Cam), one of many temples scattered around the Old Quarter. 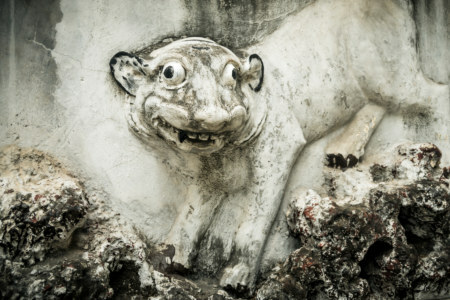 Silly tiger outside Đền Quán Thánh 真武觀, a popular tourist attraction near the West Lake (Hồ Tây). 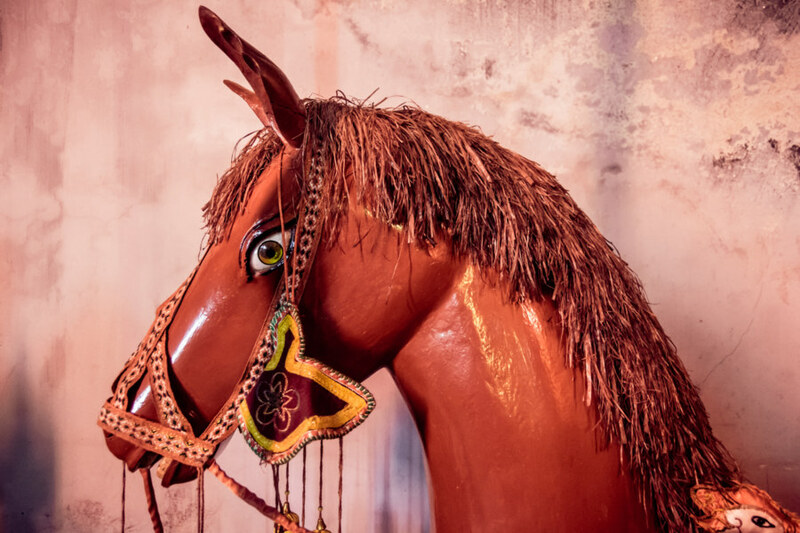 A red horse rests against a wall inside Đình Đông Thành 亭城東 (also written up here on my blog). White horses are of particular importance to Hanoi but I don’t know how red horses fit into the big picture. 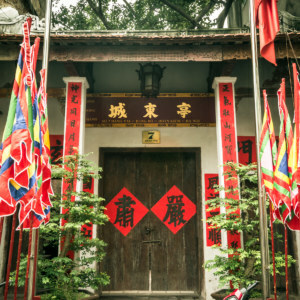 Chùa Trấn Quốc 鎭國寺, reputedly the oldest Buddhist temple in Hanoi, is located on a small island in the West Lake. 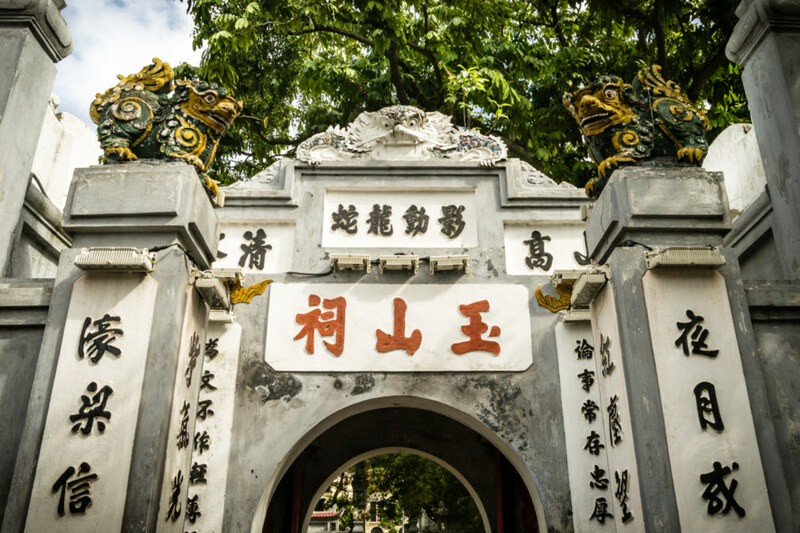 Gateway to Đền Ngọc Sơn 玉山祠, the Temple of the Jade Mountain, on Hoàn Kiếm Lake. 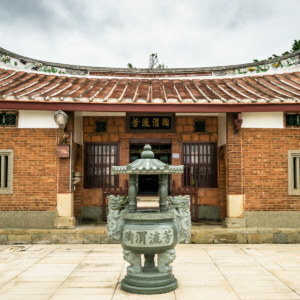 The interior of this mostly Taoist temple actually reminded me of some Hakka shrines I’ve visited in Taiwan. 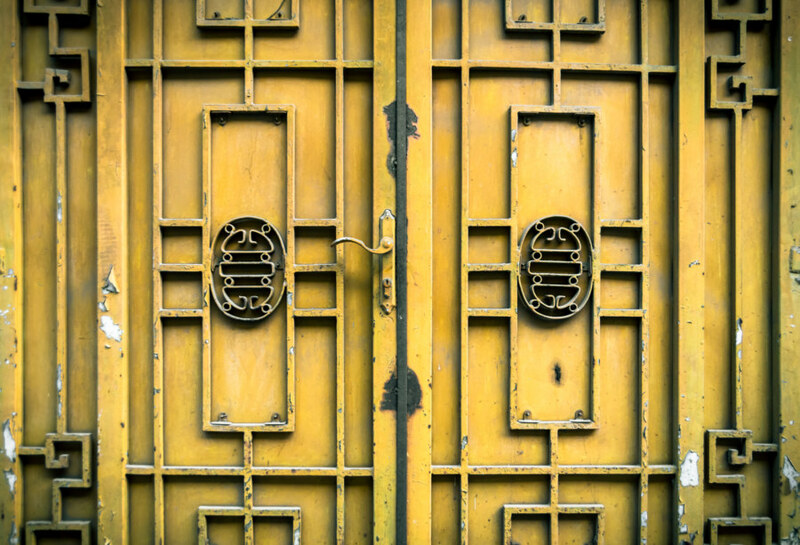 My eyes were drawn to interesting doors every which way I went in Hanoi. Here’s one with intriguing yellow metalwork. 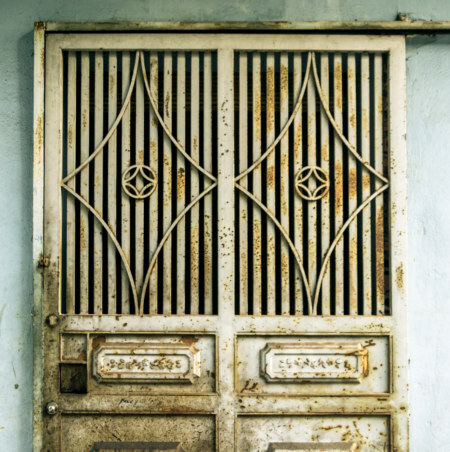 Another metal doorway. There seemed to be no end to the variety of entrances around town. 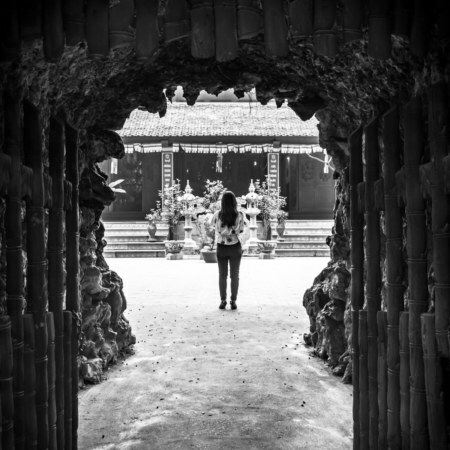 Peering through the sculpted gateway of a temple across from Hanoi Station. 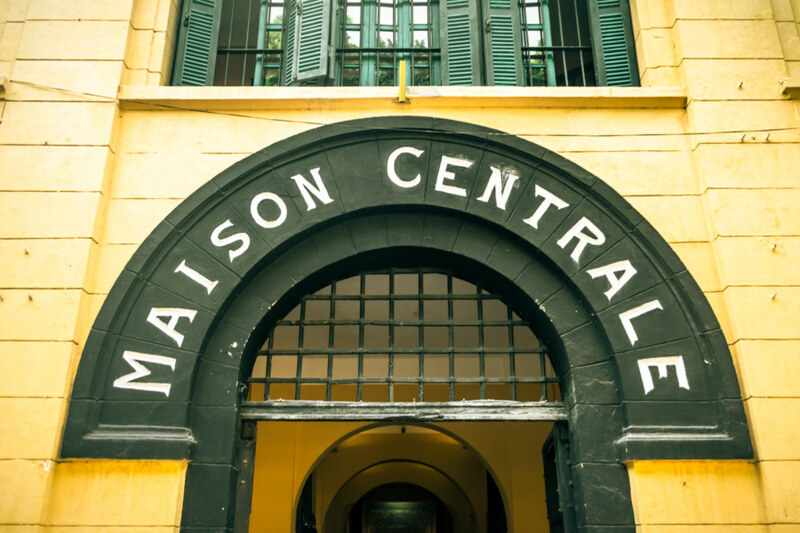 The iconic entrance to Hỏa Lò Prison, originally built by the French in the late 19th century, hence the name Maison Centrale. 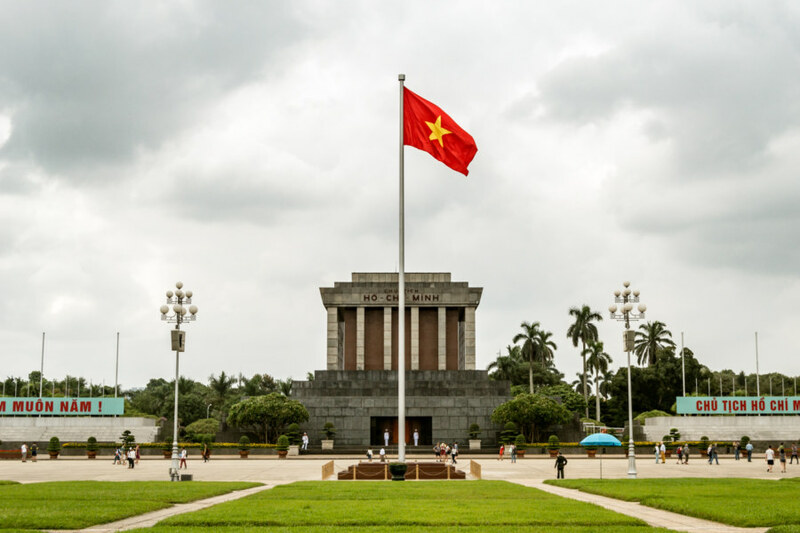 To the Vietnamese people it is a symbol of colonial oppression but to English-speaking westerners it is more famously known as the Hanoi Hilton, where many American POWs were held during the Vietnam War. 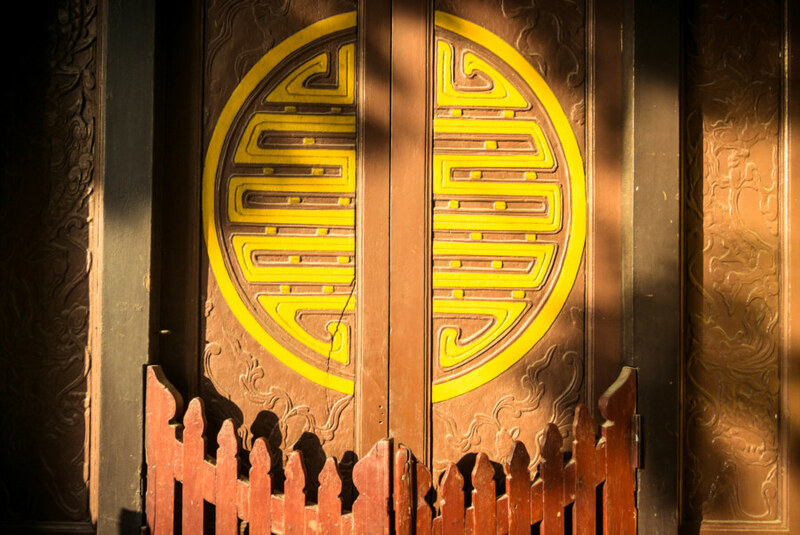 The sealed entrance to a Hanoi shrine in the golden light of late afternoon. 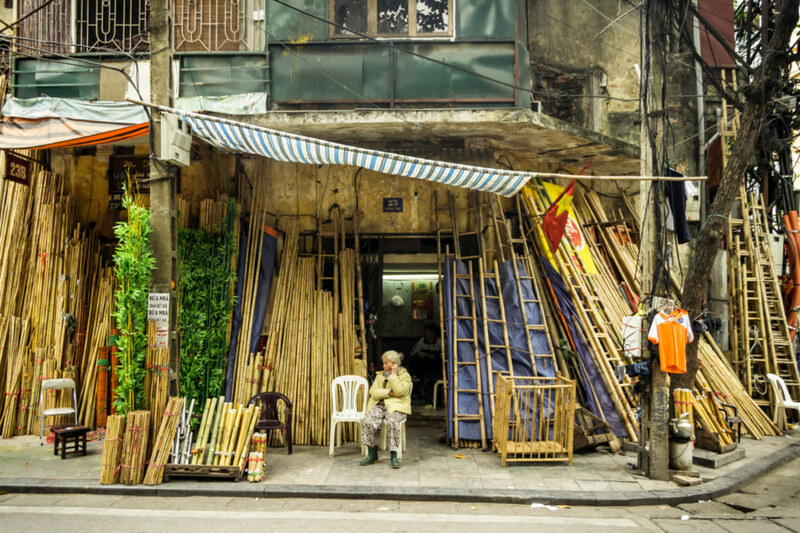 One of several bamboo vendors on Hàng Vải, traditionally a street for the cloth trade. 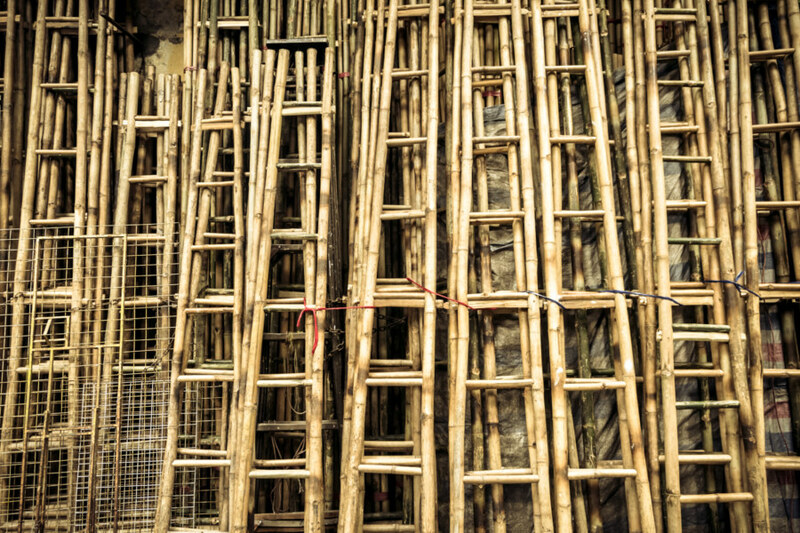 Bamboo ladders leaning against a wall on Hàng Vải. Many of the major railway crossings on the west side of the Old Quarter are staffed by people charged with pulling the gates across the road and directing traffic before a train rumbles through. 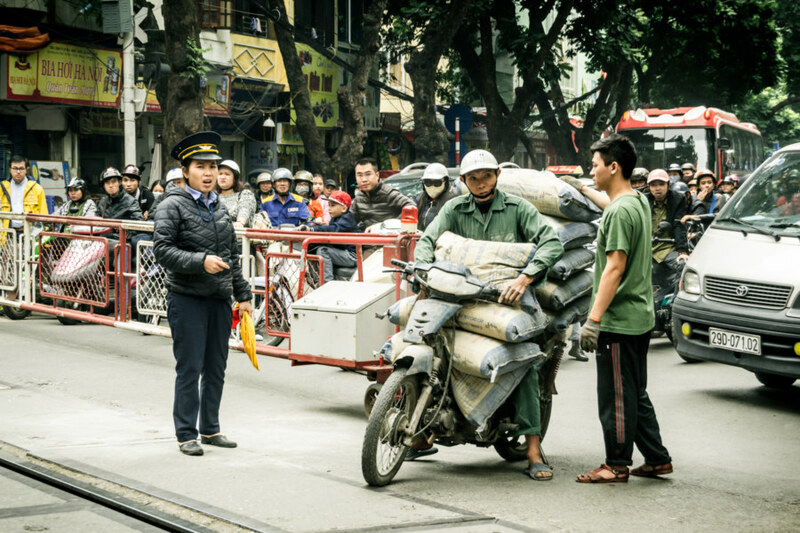 The deliveryman pictured here was jostling toward the front of the pack when his load of many sacks of what is probably flour spilled onto the roadway. A helpful passerby assisted him in packing up again before the train arrived. 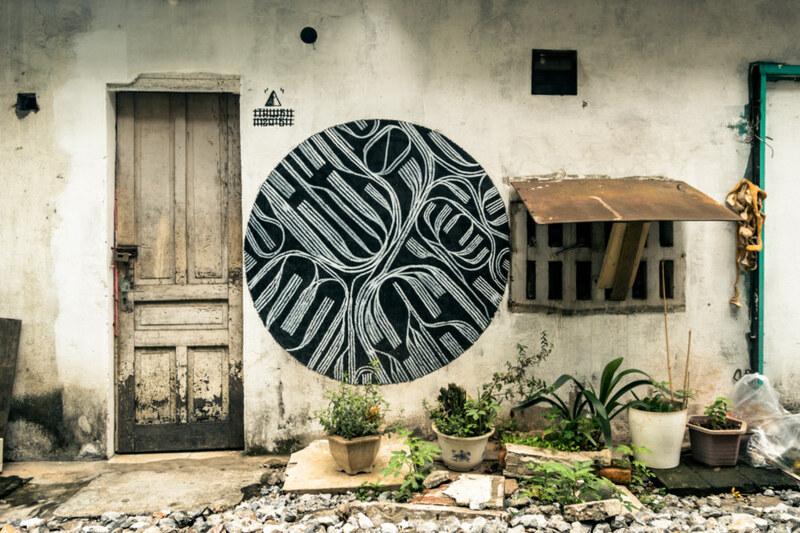 Street art along the railway line on the west side of Hanoi’s Old Quarter. 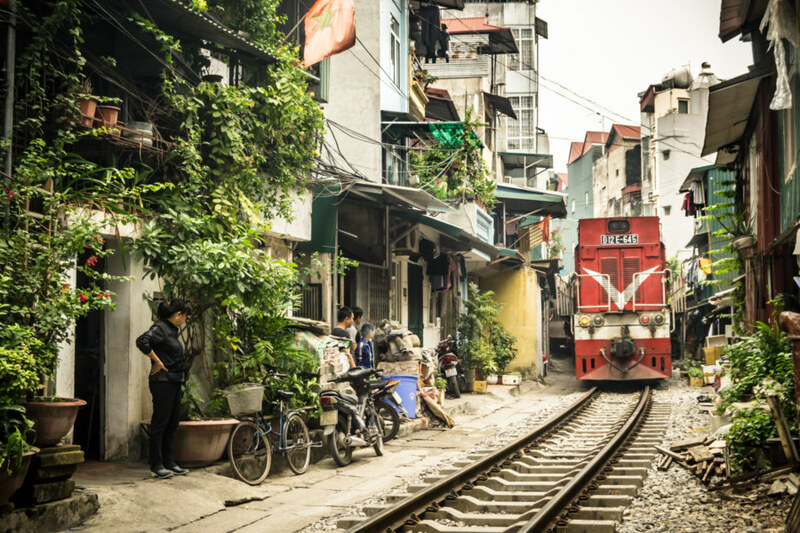 A train rumbles through the tight confines of a residential neighbourhood on the west side of the Old Quarter of Hanoi. 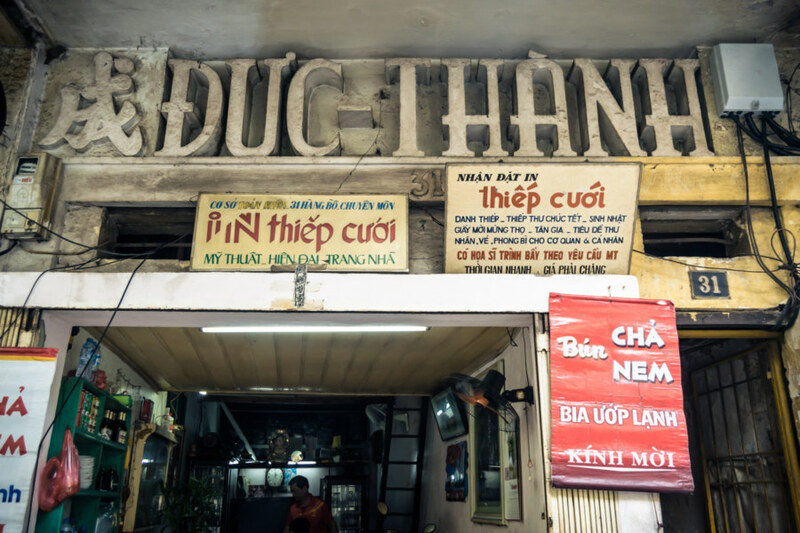 Classic lettering can be discerned on many storefronts in the Old Quarter. 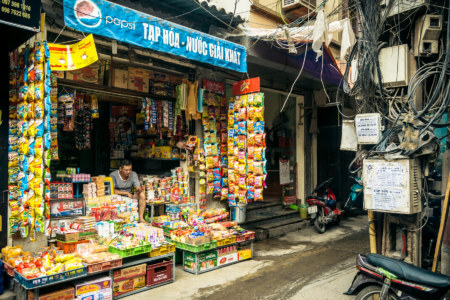 In this case the shop is identified as Đức Thành, which I believe just means general shop or something along those lines. 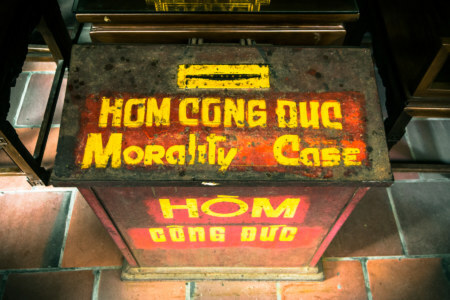 A donation box inside a Hanoi monastery. 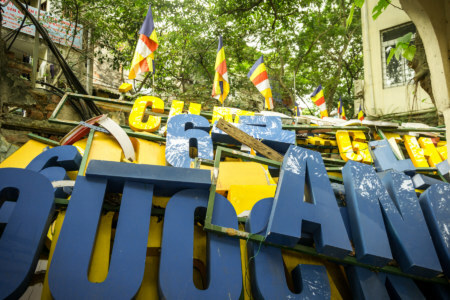 A jumble of signboards in the courtyard of a temple. Snack vendor in the laneways of an ordinary neighbourhood just west of the central train station. 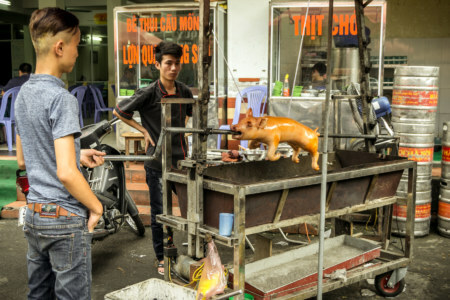 Suckling pig roasting on a spit outside a restaurant near the back side of the central train station. Choking on the smog: the air pollution index was at extremely dangerous levels for most of my stay in Hanoi. 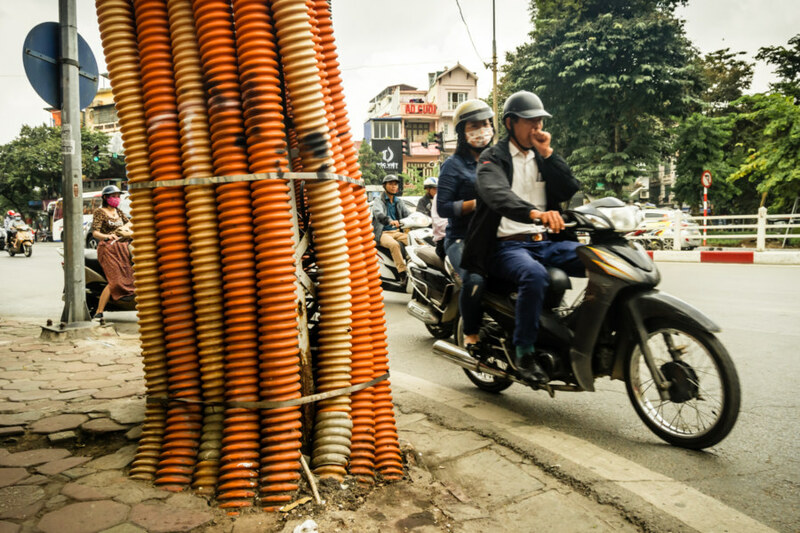 Unbeknownst to me prior to visiting, Hanoi has one of the worst air pollution problems in all of Asia. 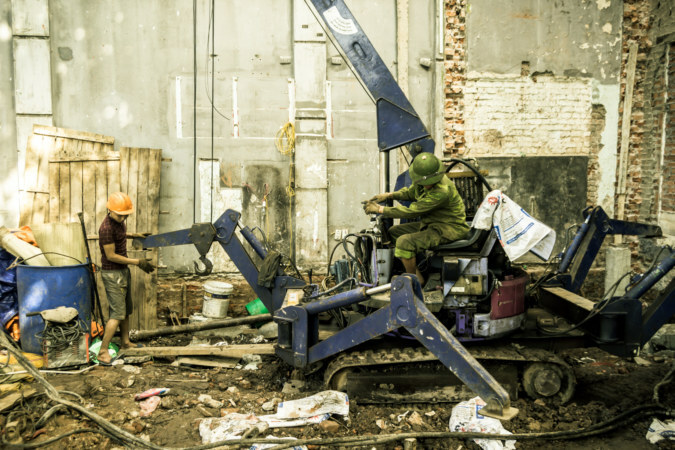 Construction workers across from St. Joseph’s Cathedral. 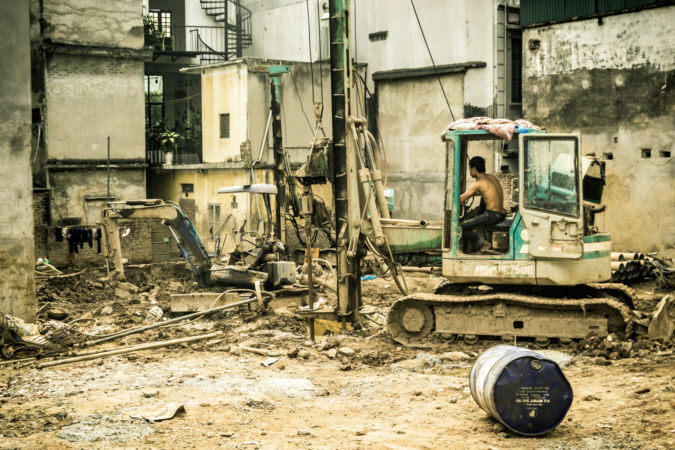 Probing the depths of Hanoi somewhere near the West Lake. 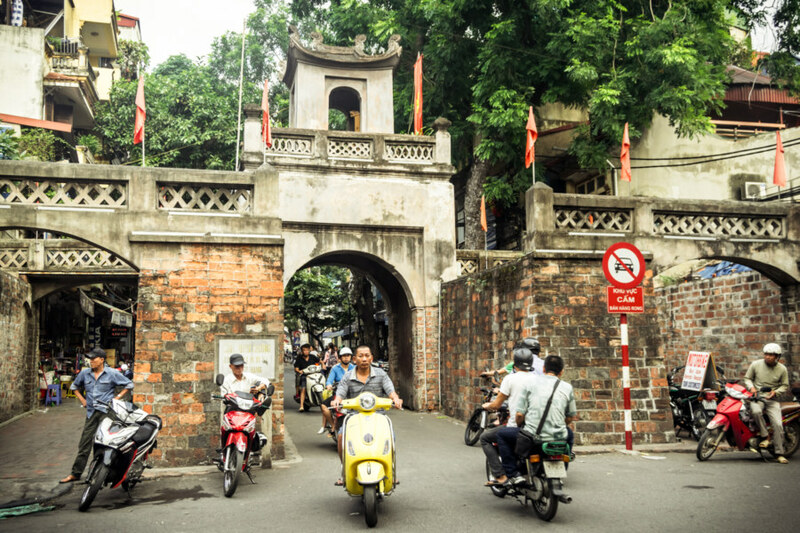 Ô Quan Chưởng 東河門, the old eastern gate of Hanoi. Despite the “no cars” sign I saw several drive through, honking and blinking their lights to force other motorists out of the way, as I waited for a halfway decent shot of the busy gate. Bundling up wholesale orders somewhere in the labyrinth that is the massive Dong Xuan Market (Chợ Đồng Xuân). 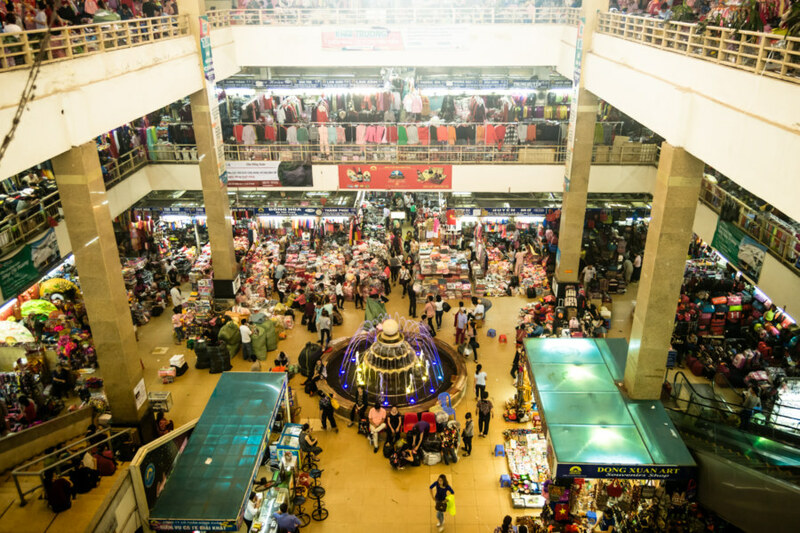 Inside the bustling Dong Xuan Market. 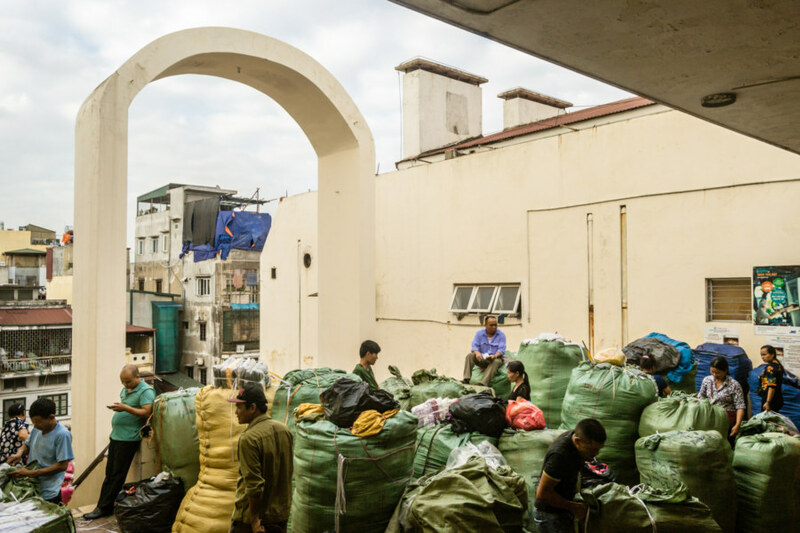 Pretty much everything on the upper levels is devoted to wholesale clothing. Peering over the edge of Dong Xuan Market, looking down on the busy streets below. 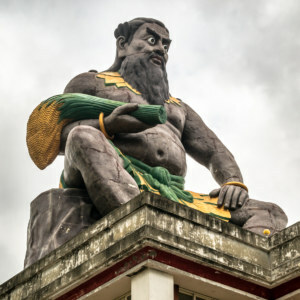 Hang Gai Martyr’s Shrine (Nhà Tưởng Niệm Liệt Sỹ). 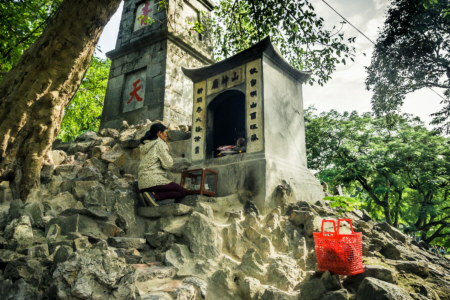 Whereas the Temple of the Jade Mountain was more of a tourist attraction, this small shrine to the Mountain God 山神 (perhaps Sơn Tinh) just out front was quite popular with locals. 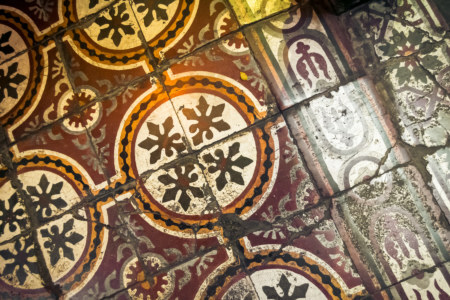 Ornate tile flooring in the entrance to Cafe Phố Cổ at 11 Hàng Gai. 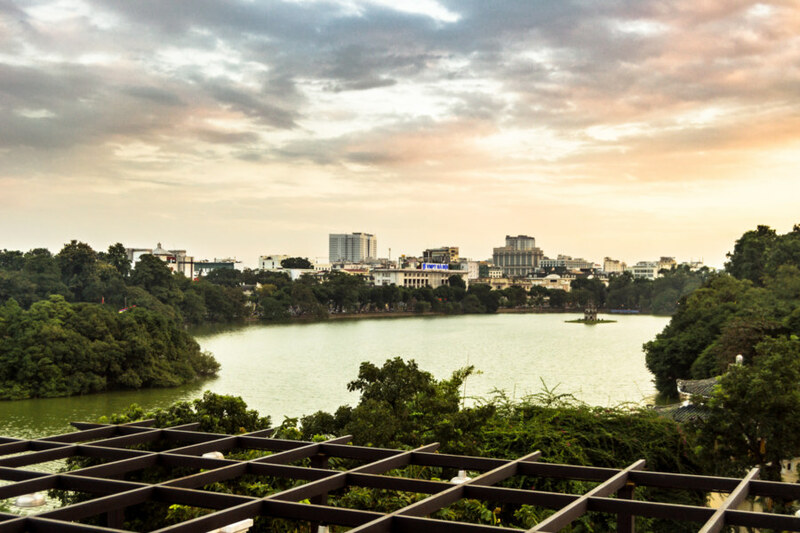 Hidden away from this street, this cafe has a rooftop patio with a great view of Hoàn Kiếm Lake. 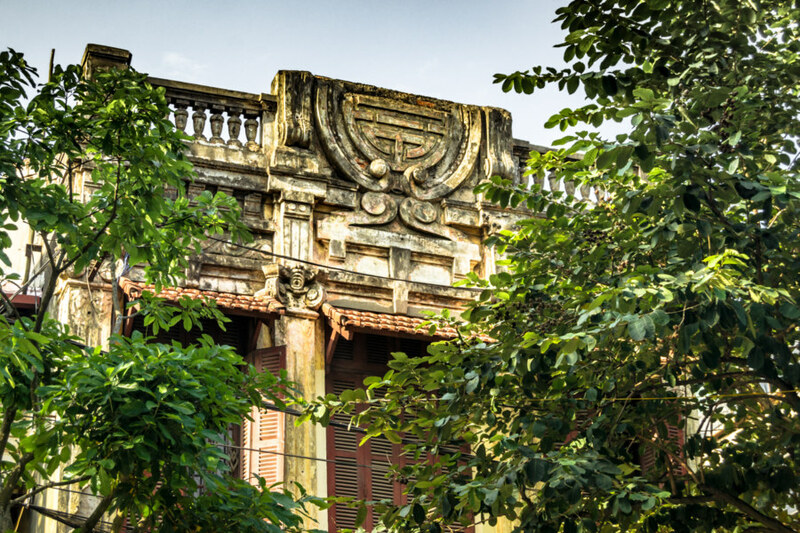 Ornate carvings on top of a shophouse in the historic Old Quarter of Hanoi. 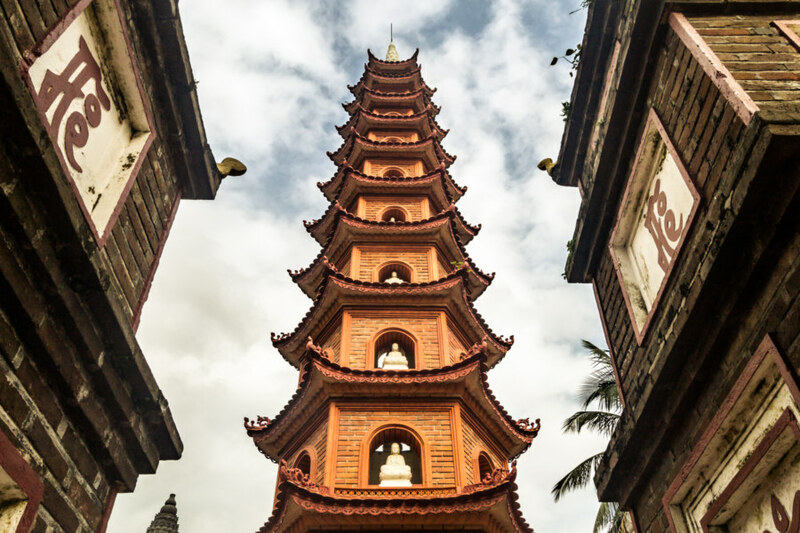 A closer look at the distinctive pagoda at Chùa Trấn Quốc, apparently the oldest Buddhist temple in Hanoi. 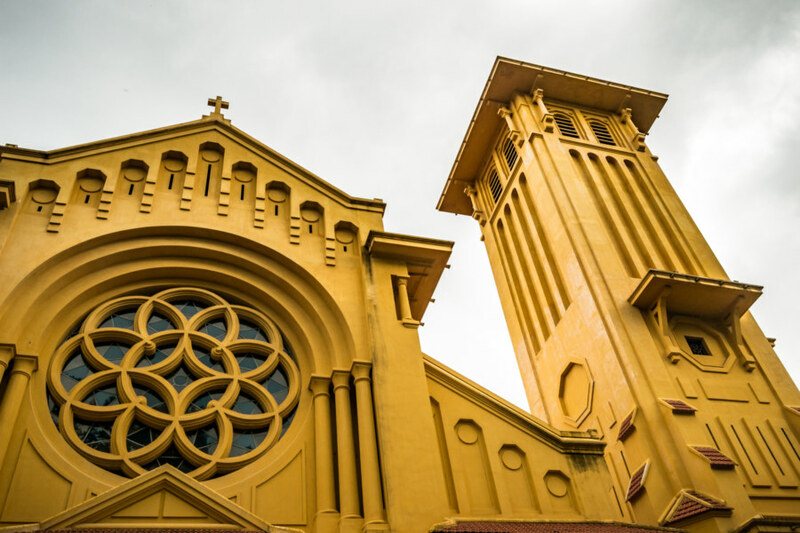 Gloomy skies over the distinctive French colonial Cửa Bắc Church. 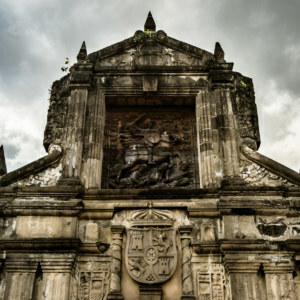 Turtle Tower (Tháp Rùa) honours the legend of Hoàn Kiếm Lake. 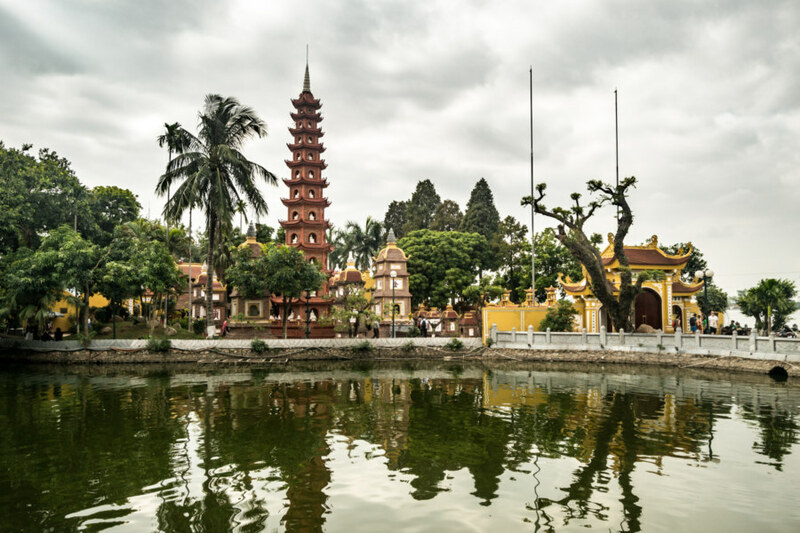 In the 15th century a Vietnamese king defeated the Ming Chinese with the help of a magic sword, Thuận Thiên 順天, literally “Heaven’s Will”, which originated with a dragon living beneath this lake. Thereafter the sword was returned to the dragon by way of a turtle god living near the surface. This is how the lake gets its name—which is literally “Lake of the Returned Sword” in Vietnamese. Sundown over Hoàn Kiếm Lake. Not bad for my last night in Hanoi! 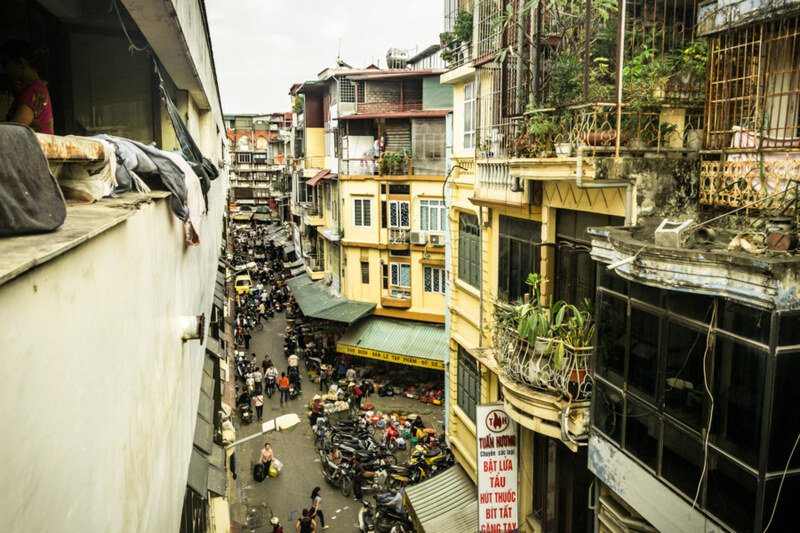 Overall I had a great time in Hanoi, a city more pleasant than its reputation may suggest. 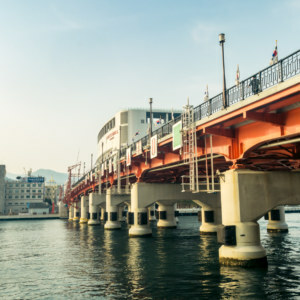 The air pollution was incredibly bad some days—and I was quite surprised at the incredible number of fellow western tourists around—but I would readily return should the opportunity arise. 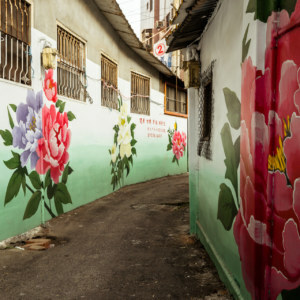 Apart from the sights articulated through these photographs I also have three recommendations to make: Savage, an underground club on the north side of the West Lake; Tadioto, a cocktail bar and art space southeast of Hoan Kiem Lake; and Xofa Café, a great working cafe in the 24-hour restaurant zone on the west side of the Old Quarter. Many thanks to everyone who passed on tips that made this little visa run a real pleasure! 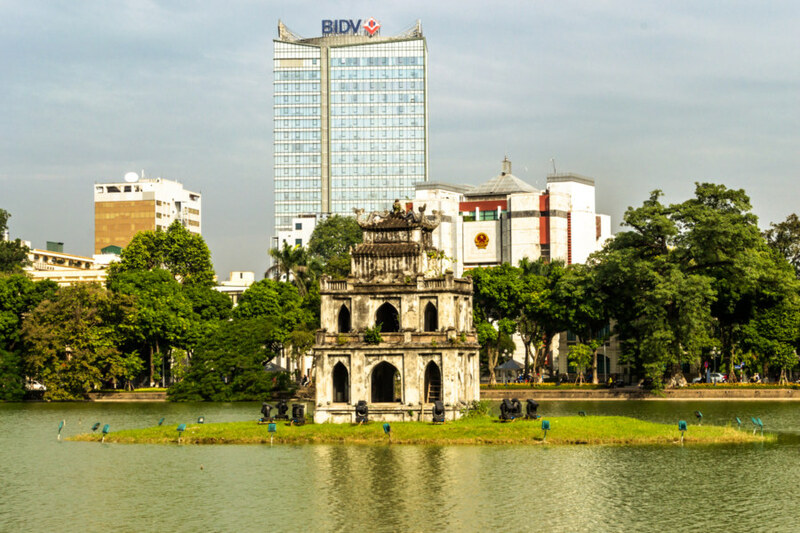 Wow, I’m Vietnamese and Hanoi is sooo beautiful, I miss my country! Thank you for these photos!